Ah yes. Wonder Boy. One of the first games created by the great Westone and the start of an incredibly fondly remembered, yet highly underrated series. 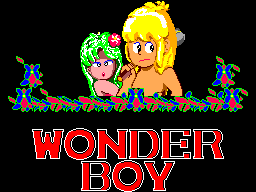 A port/ enhanced version of the beloved arcade game of the same name, Wonder Boy tells the story of a young man named Tom-Tom and his lovely girlfriend Tanya. Everything was going great for this young couple, but that all changed when the evil Witch Doctor named Drancon kidnapped the love of his life. Of course our hero naturally isn't gonna take that, and so he goes on a long and tedious quest to save her. Well, in case you haven't already guessed, this is one of the magical Master System's many numerous platformers. In this game, you must cross 7 rounds, each with 4 zones, filled with traps and many enemies. To stay alive, you must not just avoid getting hit, but also you have a "vitality" meter, which acts as a bit of a timer. You must eat the food that randomly pops out of literally nowhere to keep this meter up. There are also many items, found inside various eggs besides the obvious hatchet to help Tom-tom in his adventure.The skateboard allows Tom-Tom to take an extra hit, but causes him to move forward automatically and makes him tougher to handle, then there are the hidden SEGA letters that if you collect four of will you get an extra Chance. There are also wooden dolls, which if they are all collected, may make you realize the game was longer than you thought ;-) (and just so you know, not all are out in the open). Lastly, there is Tom-tom's guardian angel, who makes him invincible!. There is a power down though, for if you open a spotted egg, you will quickly find a grim reaper who will follow you around, quickly causing your vitality to drain away. Lastly, every so often, you may find one of Tanya's belongings, which will cause another girl to take Tom-Tom to a bonus round in which he collects hearts to boost his score. The graphics are some of the best on the Master System, and even more so considering this is one of its earliest titles, and in some ways even improving on the arcade version. Everything is bright, colorful, and detailed, and has a bit of an adorable look to it. The sound effects are pretty much what you expect from a Master System game, just the normal PSG bleeps and bloops. The music is simple, but catchy and you may find yourself humming it from time to time. I just wish they put more tracks in it though. The controls are pretty simple, and they will be familiar to you if you had played a certain fat plumber's games whose name shall not be mentioned. 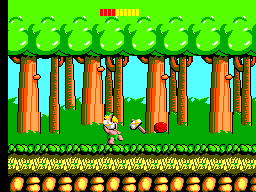 You press 1 (or B if playing on a SEGA Mega Drive/ Genesis via Power Base Convertor) to run and throw your hatchet to bonk many of the island's crazed inhabitants, and 2 (or C) to jump. Controls are very responsive and fluid, so there is no reason to blame yourself losing on the controls. Well, this game is super fun, and a bit tough, so you'll naturally keep coming back to this addictive little gem until you beat it. Once you do, you probably won't play it as much, but you'll more than likely drag it out time to time to go down memory lane. This game is just incredible. It is truly one of the few arcade ports SEGA truly tried their hardest on. It really beats every version out there (including that rip-off Adventure Island for the NES) and you won't find a game with such charm very likely. This is a must have, and luckily doesn't go for a lot on eBay (even if you're from America like me where SMS games aren't so common). 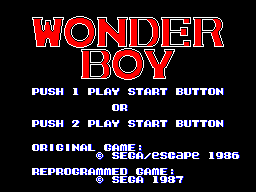 I just wish they had made actual sequels to the original Wonder Boy along with the Monster World series.